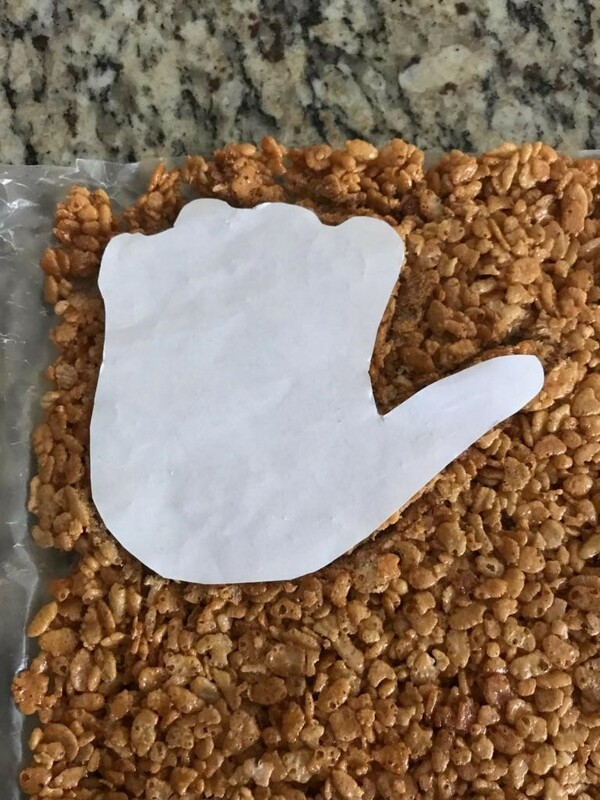 Who doesn’t love ooey gooey marshmallow, crispy, cereal treats? Kids love making them almost as much as they love eating them. 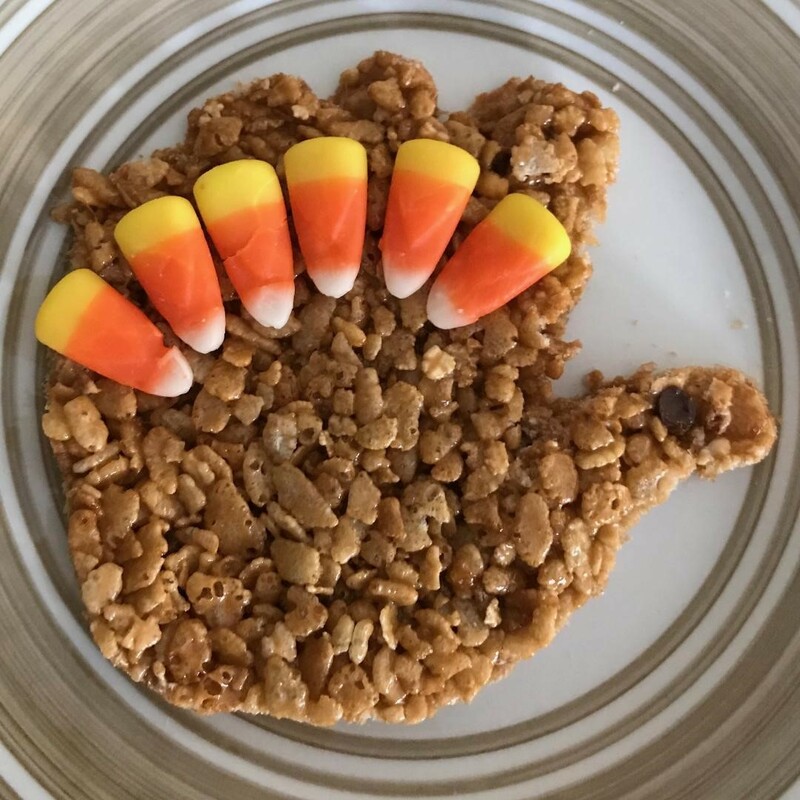 Now making them can be even more fun when you turn those crunchy sweet treats into turkey shapes for your Thanksgiving Day celebration. As a bonus, you can also use up any candy corn you have left over from Halloween. First gather your ingredients and your tiny chefs. 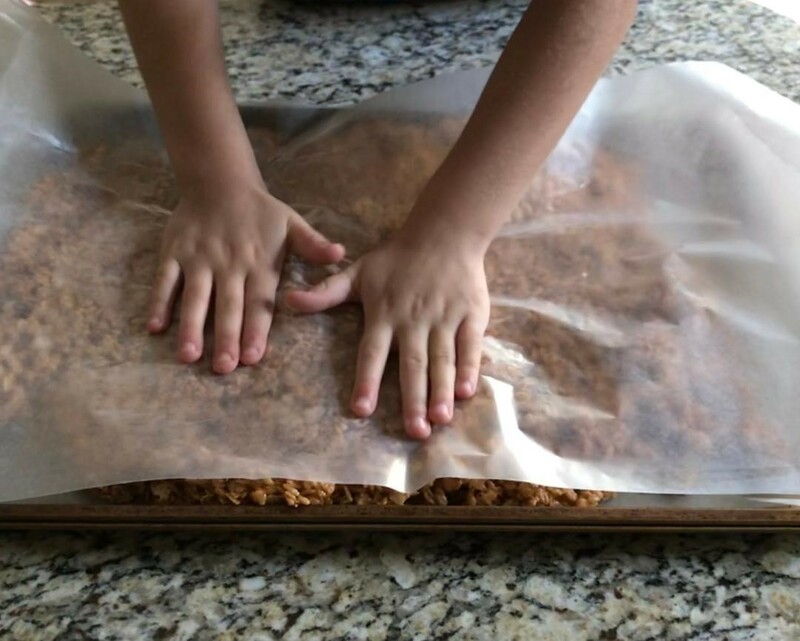 Tear out two pieces of wax paper that are slightly larger than your cookie sheet. Using one of the pieces of wax paper, line the bottom of your cookie sheet and set the other one aside for later. *Using wax paper will make things as mess-free as possible. Have an adult melt the butter over low heat in the saucepan. Add the marshmallows and stir until completely melted. 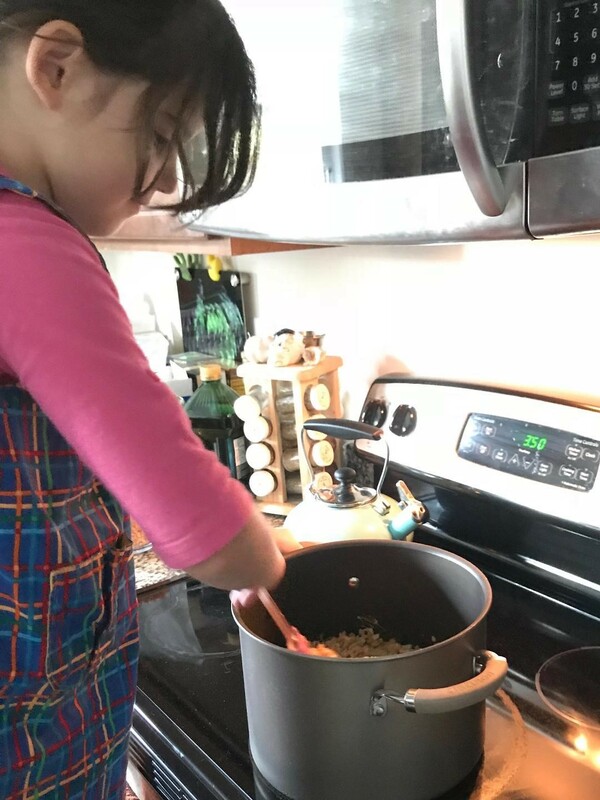 Kids can help stir while supervised. Stir in cereal one cup at a time. Make sure that all of the cereal is coated in sticky, marshmallow-y goodness. Empty mixture onto your lined cookie sheet. 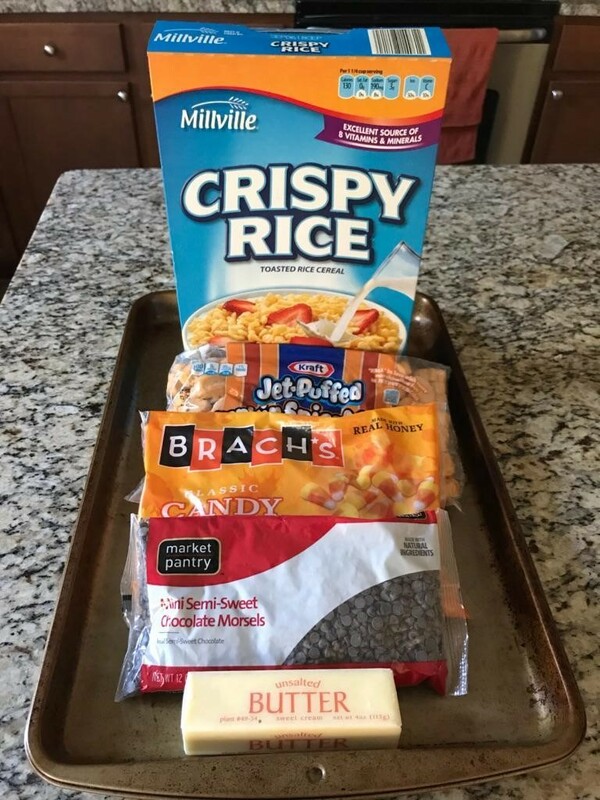 Lay your other piece of wax paper on top of your mixture and press down, spreading the cereal mix until it evenly covers the cookie sheet. Kids will have fun squishing the cereal down and the wax paper will keep their hands clean. *The cereal will be hot at first but will cool down enough for the little ones very quickly. Don’t wait too long, you want it to still be warm enough to manipulate. Let your treat cool and firm up a bit. 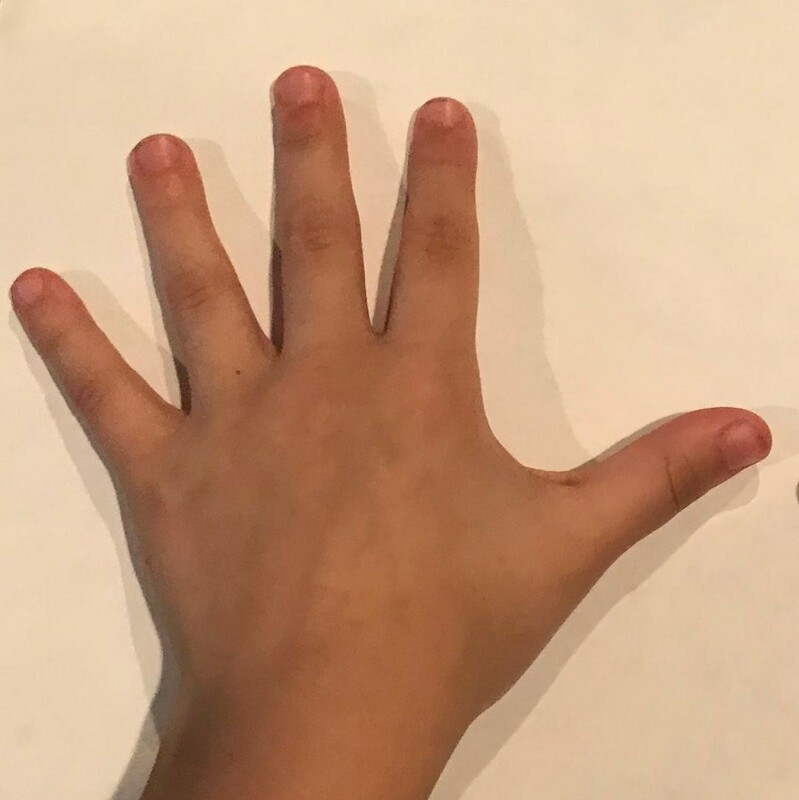 While the treats are cooling, have your child place their hand on the piece of paper and trace with a pencil then cut it out across the tops of the fingers and not down in between them. 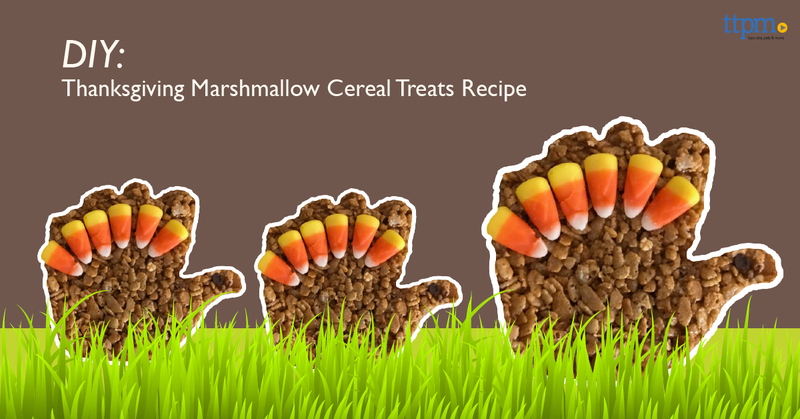 *You can also trim them down even further to help make the treats smaller and make them look more like little turkeys. Using the wax paper, lift your treats out of the cookie sheet. Place your turkey stencil on top of the treats and have an adult cut out your turkey shapes with a butter knife. *Any leftover treat is fair game for ‘taste testing’. 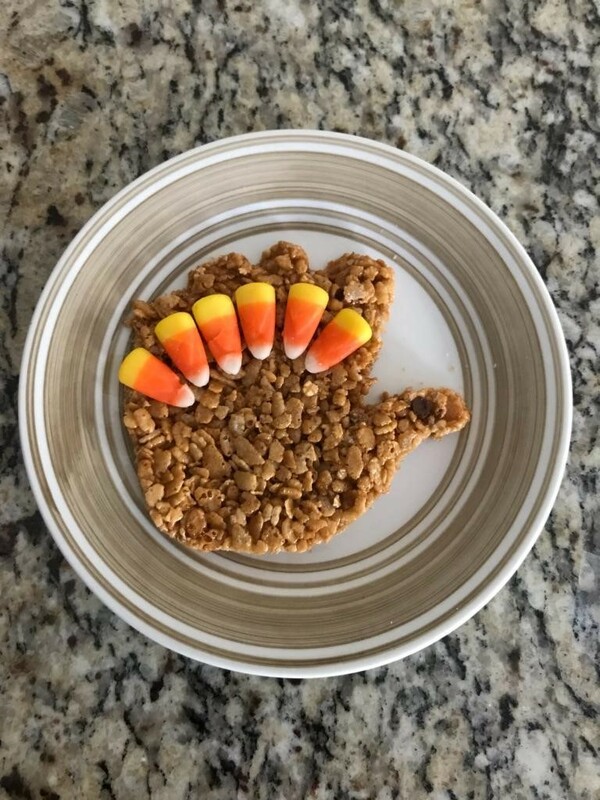 Place the turkeys on a plate and let the little ones decorate their sweet treats, using the candy corns for feathers and a chocolate for the eye. After your Thanksgiving meal you’ll have a fun festive treat to serve up to your guests. The best part about this recipe is that it’s easy for you, fun for kids, and tasty for everyone.